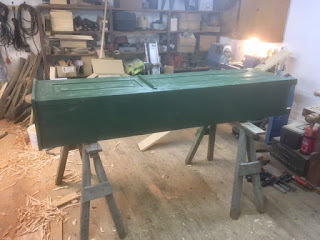 One of my long time couch builds has been a chimney cupboard as built by Bob Roziaeski for Popular Woodworking Magazine some years ago. I think that it is fair to say that the greatest obstacle for me when it comes to such a build, is to glue up some boards to the correct width for me to use. I don't know why I have such a hard time pulling myself together to glue up some wide panels, but it is just the way it is. Anyway, this Saturday evening, I started the project, determined to finish the cupboard before going back to sea. 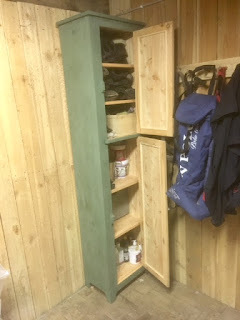 The idea was to put the cupboard into the saddle room, to help organize some of the smaller stuff used for the horses, so it wouldn't be a deal breaker if the surfaces weren't super smooth which can be hard to obtain with larch sometimes. Saturday and Sunday was spent gluing up stock and dressing it to the correct thickness by means of the jointer/planer. I wanted to prove to myself that I was able to make a speedy build without too much fussing over details. I decided that I could use my router instead of a dado plane, since I haven't got one of those, and I think that a router is a bit faster. The rabbet along the back edge of the sides were made with a moving filister plane. I pretty much followed the descriptions from the magazine, but instead of making a groove for the floating panels for the doors, I made a rabbet with the router and squared up the corners using a chisel. Then I sawed some thin strips to hold the panels in place. An advantage with this approach compared to a groove is that it is very easy to assemble the door frame at first, and then fitting the panel to the hole. The downside is that it doesn't look quite as nice. But the ease and speed of this construction method trumped. 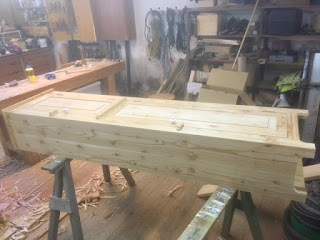 The raised panels were also made on the table saw instead of using the moving filister plane. That worked really well and was very fast. For the hinges I used some that I had purchased from Lidl. they are very coarse compared to the hinges that I regularly use, but they fitted the project quite nicely. Two small porcelain knobs and a couple of toggles to keep the doors closed made up the rest of the build. While visiting Brian Eve in Garmisch a couple of years ago, I bought some "old fashioned milk paint" from a local dealer in the town. I have never seen it for sale in Denmark, and I have been hoarding the paint ever since - waiting for just the right project. 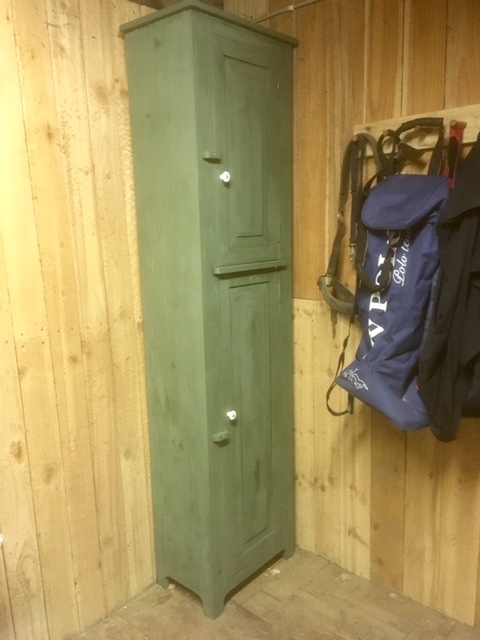 I decided that this cupboard would look just fine in Lexington green, so I mixed the small bag of powder and started painting. The paint was very interesting to use, it dries quickly and covers really well. I like the chalky texture and colour of the finished surface too, so I am tempted to try to make some experiments with milk paint at some point. Once the paint had dried, the toggles and knobs were mounted back in place again, and Asger helped installing the cupboard in the saddle room, and he also helped organize the various small pieces of equipment so the shelves were soon filled. Mette really likes the cupboard and she thinks that it is almost too nice to keep in the saddle room. So with a bit of luck I might be "allowed" to make another one at some point. Mounting the panels with strips, "horns" not trimmed yet. Chimney cupboard with open doors. Very nice Jonas! This one was/is on my list as well. Unfortunately I don't have a suitable spot for it. From what I can tell in your photo, I think it looks great where you have it. The saddle room is so small that it was really difficult to take a good picture, but the cupboard fits well in a small space due to the very limited footprint of it. I am not sure where my wife would want one to go inside the house, but I could potentially build one for the small barn at the summer house. Turned out quite well! It looks just right with the color and the space it's sitting in. I hadn't really considered such a cabinet, but will be on the lookout for a space in my house for one now. Thanks. I think the colour is really nice. and I am amazed at how the milk paint was to use. The footprint of the cupboards is only something like 12" deep and 19" wide as far as I remember. The height is 76". While I made the shelves I thought that it looked awfully shallow, but the proportions work really well once the face frame and the doors are mounted. Wow, that's impressive to knock out a well-made cabinet so quickly, especially that large and with 2 doors to fit. And no plywood. In fact I am a little bit proud of myself for making it. I tried not to procrastinate, and to be as efficient as possible. t really milled any wood lately, but it is also nice to get to the bottom of the stack once in a while. It turned out beautiful! You'll have fun experimenting with milk paint. My favorite is to top it with BLO and then a coat of paste wax. I guess it will give a shinier surface to top of with the BLO, right now it is a very flat green. But I kind of like it. Olav dropped 10 kg of chalk one day, so I'll try to use some of that for a filler in the future home made milk paint. I hope he didn't drop it on his foot! He dropped it off at my place, or more correctly, he handed me the bag that contained the 10 kg, and then I placed it gently on the floor inside the shop.